Works in are currently sorted by approximate date except where there are many works by one artist (in which case works are grouped by that artist). When an image is available for viewing, titles of pieces are highlighted. Works listed are paintings unless otherwise noted. To assist those researching, reference is made to Louis Peter Grijp's article, "Fret Patterns of the Cittern" (Galpin Society Journal, XXXIV, pp.62-97). Where an image corresponds to one used in Grijp's study, I have cited this source in the additional comments section by the designation "*LPG" plus his reference number. All attempts have been made not to reproduce any copyrighted image (unless express permission has been given). Most of the images presented here were found on the Internet via standard Internet search engines. Images have been freely borrowed from various sites when no copyright notice exists. When an image has been designated as copyrighted, a low-resolution thumbnail image has been provided only for point of reference, and a hyperlink to the appropriate website has been given in order for one to view the larger image. Please note that permission should be obtained for the duplication of any of the images on this site. Should a copyrighted image be mistakenly included in the gallery, please contact me. sculpture Benedetto Antelami ca.1180 Baptistry in Parma, Italy Shows an instrument with four distinct strings, a bridge, definite raised frets, and small wings at the top of the body. 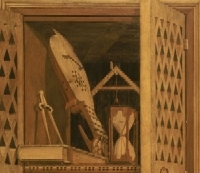 Studiolo from the Ducal Palace in Gubbio (detail). intarsia Designed by Francesco di Giorgio Martini (1439�1502); Executed by Giuliano da Majano (1432�1490); Italian; Made in Gubbio, Italy. 15th century (ca. 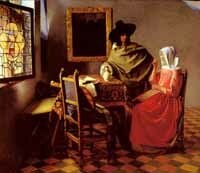 1479�82). Metropolitan Museum of Art, New York (?) Notice the unusual frets on this instrument (raised pieces of wood rather than inlaid metal frets). Perhaps one of the earliest reliable(?) pictures of a cittern in art in existence. 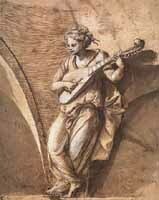 "Lute player" [sic] drawing Girolamo da Treviso (1498 - 1544) France, Private collection Pen, ink, wash, and chalk. 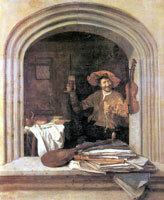 Despite the title, the image clearly shows a cittern. Sold in 2005 on ArtNet, http://www.artnet.de. Staircase carvings (citterns and bandoras?) carving anon. 1582 Staircase carvings from "Theobalds," William Cecil's (Lord Burghley's) house near London, now in Herstmonceaux Castle. Photos reprinted by permission of Peter Forrester. According to Forrester, "Note (especially by position of the bridge relative to the bouts) the parallel bridge and frets on 6 course [bandora? ], angled on 7 course." "Monkey playing diatonically fretted cittern" drawing? from the German MS. Splendor Solis 1582 MS Harl. 3469, f.3., British Library Can be seen on the front cover of Roxana Gundry-Brookes' modern cittern tutor. 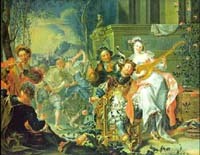 This detail is part of a "masque" scene and depicts a typical "English Consort" of six musicians playing (from top, going clockwise): lute, cittern, bass viol, bandora(? 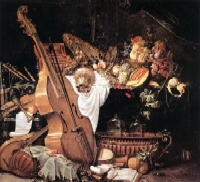 ), treble viol, and flute. See full painting at National Portrait Gallery website. 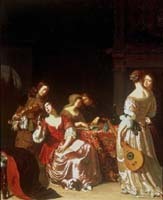 Two lute players, a cittern player, and a singer perform from the balcolny above the wedding feast. 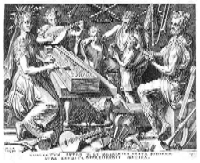 While no music for an ensemble of this sort survives, the closest approximation would be the Pacoloni lute trios plus the cittern part from Viaera. 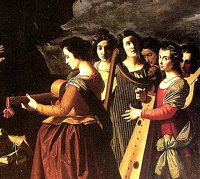 "Dives and Lazarus" (detail). 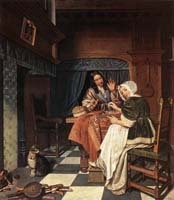 painting Marten de Vos 16th c. Private collection. 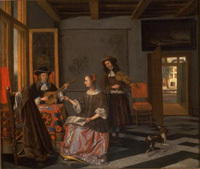 Three lute players and a cittern player play from a balcony in the detail from this image. Of note is that they all play from open music books (suggesting amateurs or servants rather than professionals?) 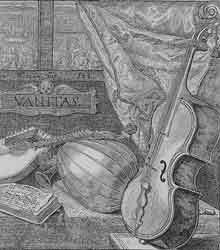 and that this is the same instrumentation used by the Pacoloni/Viaera lute/cittern books. (detail) painting? ? 16th c.? Gilling Castle, Yorkshire (England) Part of the frieze in the Great Chamber of Gilling Castle, Yorkshire (England). 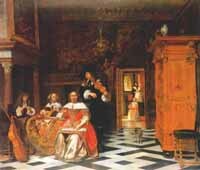 The lady in the center plays the cittern while the gentleman on either side of her play different size viols. 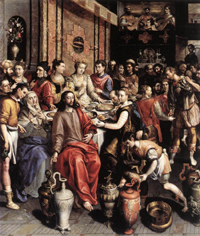 "Last Supper" painting Salviati 16th c.? sacristy of the Salute, Venice Originally in the monastery of the Spirito Santo in Isola. 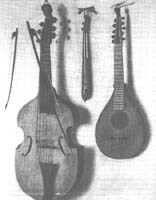 Cited in "Italian Citterns in the Museum of the Paris Conservatoire" by Peter Forrester, The Lute (Journal of the Lute Society), vol. XXXI (1991). organ doors painting Salviati 16th c.? sacristy of the Salute, Venice Originally in the monastery of the Spirito Santo in Isola. One panel has a picture of Saul hurling a spear; the other has an image of David dropping his cittern. 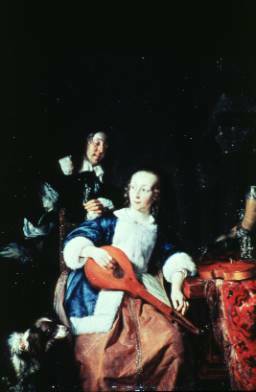 Cited in "Italian Citterns in the Museum of the Paris Conservatoire" by Peter Forrester, The Lute (Journal of the Lute Society), vol. XXXI (1991). 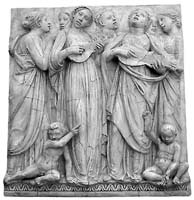 The cittern is partially obscured — upper right hand corner. 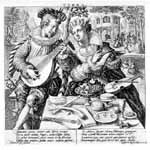 One can tell the cittern apart from the other instruments by the strings which pass over the bridge and attach to the end of the instrument. 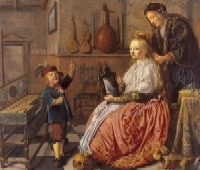 "Young Man and Woman making Music" painting Jan Molenaer c. 1630-32 National Gallery, London. cat. no. NG1293. Bought, 1889. Oil on canvas. 68 x 84 cm. Larger image available at the National Gallery website. 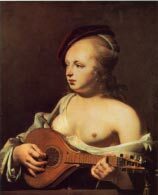 "Youth Playing a Guitar" painting Astolfo Petrazzi (1580 - 1653) ? Sold at auction by Sotheby's New York, January 27, 2006, sale NO8162. 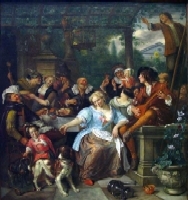 Listed in the catalogue of "Important Old Master Paintings," Lot no. 217. The title mistakenly identifies the instrument as a guitar (thanks to Michael Fleming and Peter Forrester for calling this painting to my attention). 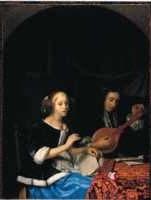 The painting is remarkable in that it shows a cittern in very great detail. It appears to have 6 courses and very specific diatonic fretting. Depicts a very large (bass?) cittern. 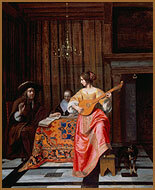 "Musical Conversation" engraving C. J. Visscher after Esais and Jan van de Velde (1586-1652) - Shown as the cover illustration to The Lute (Journal of the Lute Society) vol. XXIII, part 1 (1983). "Cittern Player (Allegory of Hearing)" painting Cornelis Bega (1631/32-1664) Gemeentemuseum, The Hague, Music Department panel, 41 x 35.8 cm. 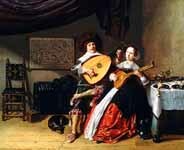 "A Woman singing and a Man with a Cittern" painting Godfried Schalcken c. 1665-70 National Gallery, London. cat. no. NG998. Wynn Ellis Bequest, 1876. Oil on oak. 26.6 x 20.4 cm. 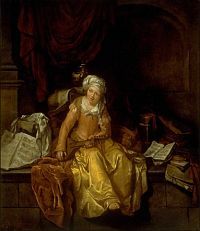 A very large image view of this picture can be seen at the Rijksmuseum page. 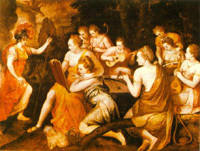 "Musical Company" painting Jan Hermansz van Bijlert (1597/8-1671) The Hague, Gemeentemuseum panel, 68 x 95.5 cm. panel, 56 x 89 cm. 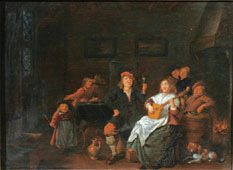 The cittern can be seen on the table on the right. "The Virgin surrounded of the symbols of vanity" painting Jan van Kessel (1626-1679) Belgium, private collection(?) Oil on canvas. 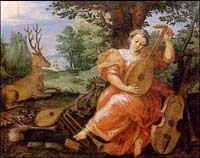 Angel Playing the citra or cithara (cittern). statue anon., Portuguese c. 1680 Monastery of Alcobaca, Leiria, Portugal. Image provided by Pedro Caldeira Cabral. "The Family Portrait" painting Michiel van Musscher c. 1689 Koninklijk Museum voor Schone Kunsten, Antwerp oil on canvas(?) Inventory #739. The image is currently in storage by the museum. Crackling of the paint has obscured some of the image, in particular the music from the open book of (cittern?!) music. "Still life with a volume of Wither's Emblems " painting Edward Collier 1696 Tate Britain, Millbank, London No. 5916. According to Peter Forrester, this is a "very detailed cittern (worm-holes etc.) of Playford's period. Four double courses; 1 and 2 paired iron? 3 and 4 paired twisted brass." 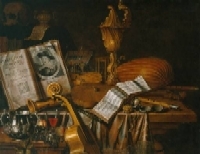 "Musical Instruments" painting Evaristo Baschenis mid-17th c.? Accademia Carrara, Bergamo(?) 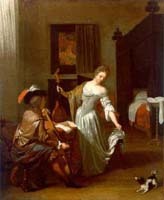 One of several paintings by Baschenis or his followers which may depict a ceterone (see the second pegbox just visible above the back of the lute). "Mrs. Philip Thicknesse, née Ann Ford" painting Thomas Gainsborough 1760 Art Museum, Cincinnati, USA oil on canvas. 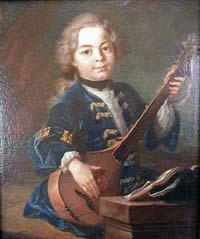 Depicts an English guittar. This painting was apparently the victim of the Nazis' seizure of Jewish cultural property in France during WWII and was a part of the "Jeu de Paume" Museum in Paris from 1940-1944. For more information, see The Documentation Project: Project for the Documentation of Wartime Cultural Losses ("View 3e").